Hanoi (VNA) - The special preferential policies for Van Don Special Economic Zone must make it superior to the country’s existing economic zones and on par with similar models in the region and world over. 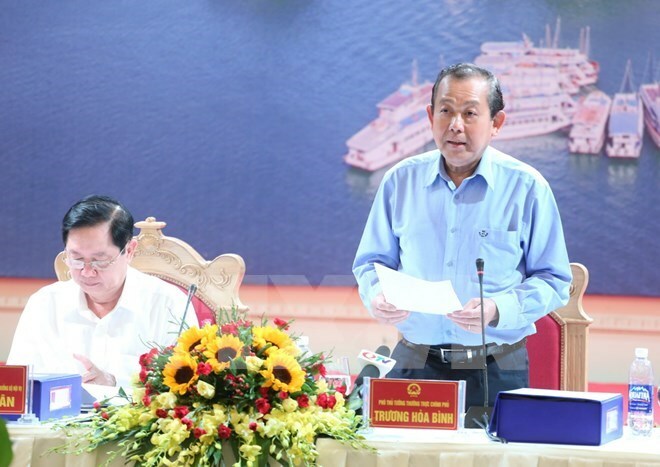 During a recent meeting with provincial authorities, Deputy Prime Minister Truong Hoa Binh required the northern coastal province of Quang Ninh to map out and propose specific incentive policies at the earliest to develop Van Don quickly into a special economic zone. Binh said the policies, which will become legal regulations, must be in accordance with international commitments and actual conditions in Vietnam, besides ensuring consistency, stability and longevity. The policies, which need to be consistent with current laws, must be superior in terms of infrastructure, tax, credit and finance so as to attract strategic foreign investors with huge projects, cutting-edge technologies and high-quality human resources, Binh said. The deputy PM instructed the planning and investment ministry to work with Quang Ninh province and complete the project. To develop Van Don Special Economic Zone, the province needs around 12 billion USD. The province has so far mobilised approximately 40 trillion VND (1.75 billion USD) , mainly for infrastructure development. A 7 trillion VND international airport in Van Don district, about 50km from Hạ Long city, which is home to the world heritage site of Ha Long Bay, is under construction, and is scheduled to become operational in 2018. Van Don has a politically and economically important position as it lies on the strategic transit route from East Asia to Southeast Asia and from ASEAN to China; in Vietnam- China “two corridors, one belt” cooperation area; in Nanning - Singapore economic corridor; and in extended Tonkin Gulf inter-regional co-operation area. Van Don Special Economic Zone is part of a Government-approved plan to build three such zones in the country; the other two are Van Phong in the central province of Khanh Hoa and Phu Quoc in the southern province of Kien Giang.